So I’ve had a few questions rolling around in my mind for a while. Does society generally reject introverts? Are they very much misunderstood? This question came up because of a frustrating situation that I encountered at a party. It was an average party with food, music, people, fun, ect. 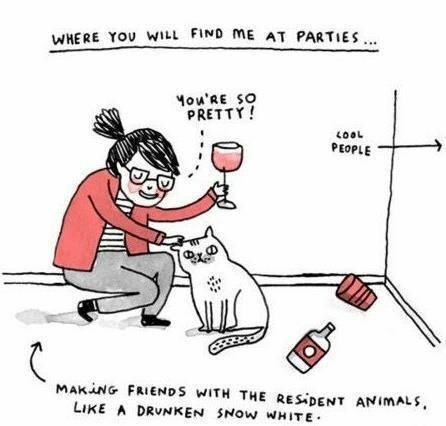 Keep in mind that my personality leans more toward introverted, but I still enjoy the environment of a party! Shocked? So there I was enjoying the party much like everyone else. I ate, talked, and danced to a few songs that I liked. As time went on, I watched as the extroverts continuously tried to pull the introverts to the dance floor. Because, well, how could they possibly be having a good time unless they were doing it in the same method as the extroverts? That just didn’t make sense. “Why aren’t you dancing?”, “You should go dance!” – Or my favorite: they run up to you, grab your arms, and pull at you until you go out onto the dance floor. Well, I didn’t. I’m stubborn like that. I just wanted to ask them, “Why?” I was having a perfectly good time doing what I was doing. I’m an adult. I know how I enjoy my time after twenty-five years on this earth. Why is that if you aren’t experiencing your surroundings as an extrovert would, people think that you are unhappy, unmotivated, and/or just not having a good day? Are we really living in a time and society that is still so misguided about what it means to be an introvert? Introversion means that the person generally thinks before he/she speaks and acts. They’re drawn to internal stimulation versus external. Extroversion is the opposite; they draw energy from their surroundings, people, ect. That being said, it should also be said that people can’t be sorted into either type. You are not solely one or the other because personalities are too complex. You may lean toward one more than the other, and that’s when it becomes obvious to you and others. 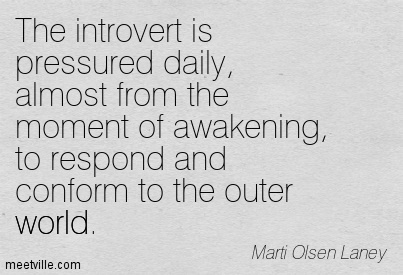 I tend to lean toward introversion. While I like to talk and dance, there are times that I prefer not to. It has nothing to do with me being unhappy. When we are young, it’s more accepted to be introverted. “Oh, he/she is just shy.” In some cases, it’s even considered cute! As you age, however, you are expected to “grow out of it”. It’s sad to say, but introverted children aren’t usually viewed in a good light by their peers and most adults. Some parents even think that something may be wrong with their children if they don’t grow out of it. Ultimately, I think we live in a society that deems introversion as unacceptable and incorrect. While I understand that in order to work certain jobs and participate in certain activities to you need to acquire more extroverted traits, I don’t think it’s acceptable to put a stigma around introversion. 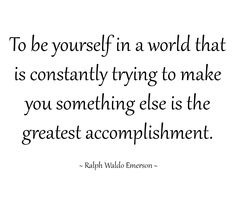 There is nothing wrong with being introverted! In fact, I would be the first to encourage extroverted people to embrace introverted habits. Listen to your thoughts, pay attention, and try to develop self-awareness. I think it would do a lot of good if society slowed down and truly took the time to turn their attention inward. 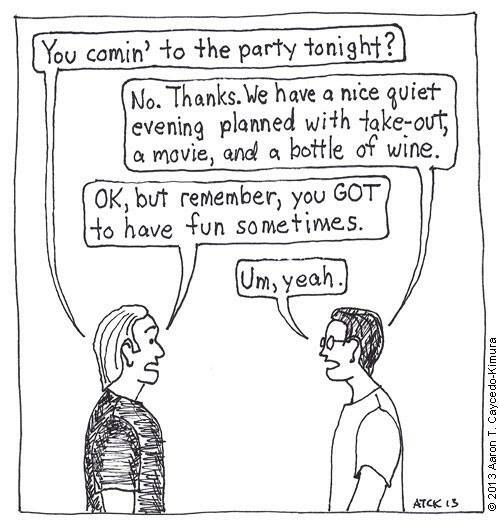 So, are you an introvert? Are you an extrovert? What do you think of how society views and treats introverts?